Wichtiger Hinweis: Der Solar Kontinuum Filter darf für die rein VISUELLE Sonnenbeobachtung NUR mit zusätzlicher Filterung (z. B. Herschelprisma oder AstroSolar Sonnenfilterfolie) eingesetzt werden. I would like to add a ND and 540nm Filter to my Canon 70-300mm lens. The lens manual says that the filter mount is 58mm (2.3inch). What adapters do I need to operate both filters on this lens? There are several other DT-rings available to attach the filter holder (which offers SP54-thread) to almost all filter threads used on camera lenses, just search for the thread of you camera lens in the search box of our website. Muss mit dem Solar Kontinuum Filter aus Sicherheitsgründen noch ein UV/IR Sperrfilter verwendet werden? Ich möchte mit einem Celestron C11, einer As120mm und Solar Kontinuumfilter die Sonne im Weißlicht fokal und mit 2x-Barlow fotografieren. Ist dieses Setup für Sonnenbeobachtungen über längeren Zeitraum (ca. 30-60min am Stück) geeignet? Und muss hierzu zusätzlich ein zusätzlicher UV/IR-Sperrfilter verwendet werden? Richten Sie NIEMALS ein Schmidt Cassegrain Teleskop ohne Filter VOR der Schmidtplatte auf die Sonne. Es wird zwangsläufig zerstört. Und Sie riskieren Ihr Augenlicht bzw. die Kamera. Die Hitze kommt hinein aber nicht mehr hinaus. Glas dehnt sich aus, Spiegel und Schmidtplatte können daher bei starker Erwärmung bersten. Es sind Platikteile im Tubus (Fangspiegelblende) und Farbe, dieses gast aus oder das Plastik schmilzt sogar. Außerdem zerspringt die okularseitige Optik, der Brennpunkt dort wird über 100 Grad heiß. Sorgt für höchsten Kontrast in der Photosphäre der Sonne. Der Filter funktioniert wie ein Monochrometer - er unterdrückt die Effekte der atmosphärischen Turbulenzen und ermöglicht somit Bilder, die deutlich schärfer werden. Besitzer von Refraktoren schneiden den Spektralbereich engbandig aus, an denen eine Linsenoptik am schärfsten und kontrastreichsten zeichnet. 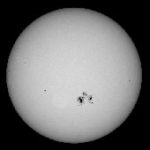 Die Kombination von AstroSolar Fotofolie (ND 3.8) und Solar Kontinuum Filter dient ausschließlich zur Fotografie der Sonne bei höchsten Vergrösserungen  in Verbindung mit einem geeigneten Projektionsokular. Dies ist nur deshalb notwendig, um trotz sehr hoher Nachvergrösserung und entsprechend extrem langen Fernrohrbrennweiten, dennoch kurze Belichtungszeiten zu erreichen. AstroSolar Fotofolie (ND 3.8) ist auch nicht dazu geeignet, direkt vor ein Kameraobjektiv montiert zu werden. Die resultierende Bildhelligkeit ist viel zu hoch. Instrument: "TSC 225 Schmidt-Cassegrain from TAKAHASHI, NJP160 mount, F/40 with 2X Big Barlow Tele-vue, NGFs focuser, and of course your incredible Baader Astrosolar filter D:3.8, IR cut filter and Continuum filter"
I use the Solar Continuum (SC) almost exclusively. Here is the "Theory" behind the SC filter. The photosphere of the sun is obscured by the gases above it (the chromosphere). The Chromosphere is only about 10,000 miles deep, but it is red and it obscures the yellower light coming from the surface. The SC filter is tuned to cut this red so that it does not obscure the photosphere to the same degree as it would without it. That is the theory. Here is my own experience but it gets technical. Filters block energy and because of this, to get something you loose something. The SC is amazing for seeing four different classes of features. 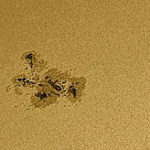 the first is the structure of the fingers in the penumbra of sunspots. I can easily see more fine detail using the SC than without it, but only when seeing steadies and power is high (I use zooms exclusively for this reason... So I can amp up when I see that seeing has steadied). The second area is pores. I see them with much more authority when using the SC. The third is granularity. Great in white light using wedge of film, but better when using SC. Last is faclula near the limb of the sun. . With the SC, they really jump out!!! Downside. 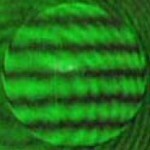 Because it is tuned more to the photosphere, when you look into the center of a sunspot (bridges) you won't see some of the detail inside the sunspot with the same authority. Bridges and light islands are sometimes ejections into the chromosphere (bridges are often arches but we see them looking down so we can't tell that at the eyepiece.) You can still see bridges and arches, but they won't stand out out as well with the SC in place. I have observed bridges as being wider and softer without the SC (the parts that are closer to us no doubt) and light islands inside the umbra will seem to be less well defined. I can sometimes see light islands with no SC that are invisible with the SC, and again, this is because these are actually I think more of where the "Steam" is sitting just above the surface. (At least I think this is what is happening but admit to the possibility of being mistaken). Here is an image that shows the kind of detail I can see inside the sunspot that without the SC that is dulled by the SC, but the fingers around the sunspot are greatly enhanced. And if using an Achromat, SC turns it into a solar Apo. I highly recommend SC. I have used a lot of "Magic" filters over the decades that did not really seem to do nearly as much as I had read they would do, but the SC is in a class by itself. Outstanding for studying anything but the detail in the Umbra of sunspots. If you are looking and see light islands, you can yank the SC to study them and see fainter ones sometimes that you can't see with the filter in place.